Definition at line 30 of file Legalizer.h. Definition at line 53 of file Legalizer.cpp. Definition at line 57 of file Legalizer.cpp. References llvm::AnalysisUsage::addPreserved(), llvm::AnalysisUsage::addRequired(), llvm::MachineFunctionPass::getAnalysisUsage(), and llvm::getSelectionDAGFallbackAnalysisUsage(). Definition at line 57 of file Legalizer.h. References combineExtracts(), MI, MRI, llvm::MachineFunctionProperties::NoPHIs, runOnMachineFunction(), llvm::MachineFunctionProperties::set(), and TII. Definition at line 43 of file Legalizer.h. Definition at line 47 of file Legalizer.h. Definition at line 52 of file Legalizer.h. 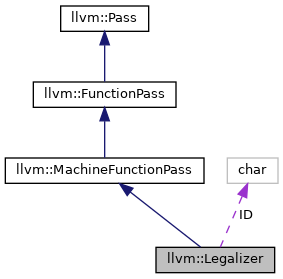 Definition at line 128 of file Legalizer.cpp. References llvm::GISelObserverWrapper::addObserver(), assert(), llvm::dbgs(), llvm::GISelWorkList< N >::deferred_insert(), llvm::GISelWorkList< N >::empty(), EnableCSEInLegalizer, llvm::MachineInstr::eraseFromParentAndMarkDBGValuesForRemoval(), llvm::GISelObserverWrapper::erasingInstr(), llvm::MachineFunctionProperties::FailedISel, llvm::GISelWorkList< N >::finalize(), llvm::TargetPassConfig::getCSEConfig(), llvm::MachineFunction::getFunction(), llvm::MachineFunction::getName(), llvm::MachineInstr::getOpcode(), llvm::MachineFunction::getProperties(), llvm::MachineFunction::getRegInfo(), llvm::Function::getSubprogram(), llvm::MachineFunctionProperties::hasProperty(), llvm::GISelWorkList< N >::insert(), isArtifact(), llvm::TargetPassConfig::isGISelCSEEnabled(), llvm::isPreISelGenericOpcode(), llvm::isTriviallyDead(), llvm::LegalizerHelper::Legalized, LLVM_DEBUG, MI, MORE, MRI, llvm::GISelWorkList< N >::pop_back_val(), llvm::reportGISelFailure(), llvm::MachineFunction::size(), llvm::LegalizerHelper::UnableToLegalize, and Wrapper. Definition at line 32 of file Legalizer.h.